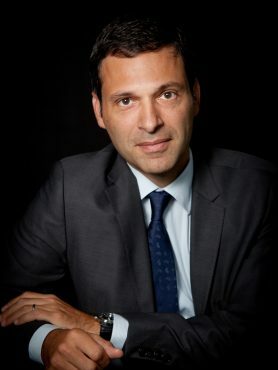 Rodolphe Saadé, Vice-Chairman and member of the CMA CGM Group’s Board of Directors, was born on 3 March 1970 in Lebanon. Rodolphe Saadé’s education and career have been marked by his international experience. Having obtained a Bachelor of Commerce degree from Concordia University in Montreal, where he majored in marketing, he founded Dynamic Concept, a company selling water coolers. As its Chairman and Chief Executive Officer, he gained his first business experience in Lebanon and Syria. Since 1994, Rodolphe Saadé has put his international business expertise to the service of the CMA CGM Group, led by Jacques Saadé. In particular he worked in New York and then Hong Kong before moving to the shipping company’s head office in Marseille in charge of lines serving five continents. From 1997 to 2000, Rodolphe Saadé was successively heading different lines between North America, Europe and the Far East. Appointed Director of the Transatlantic and Transpacific line in 2000, he became the line’s Central Director in 2002. In 2004, Rodolphe Saadé was in charge of developing regular lines on the North/South axis to North America, Central America, the Caribbean, South and West Africa, Australia and the Indian Ocean. In 2006, he was appointed to expand DELMAS’ lines in West, East and Central Africa and the Indian Ocean, turning DELMAS into an efficient and profitable operator. In 2008, when the cruise yacht, Le Ponant, was taken hostage, he was personally involved in the negotiations with the Somali pirates, up to the moment the vessel and all the hostages were freed, safe and well, by the French armed forces. In 2010, Rodolphe Saadé was appointed Executive Officer and member of the Board of Directors at CMA CGM. In 2012, Rodolphe Saadé oversees the financial restructuring of the Group. In 2014, Rodolphe Saadé is appointed Vice-Chairman of the CMA CGM Group. Rodolphe Saadé also headed the discussions leading to the three key agreements on the biggest worldwide maritime trades with China Shipping Container Lines (CSCL) and United Arab Shipping Company (UASC). In 2015, Rodolphe Saadé conducts the pre-conditional voluntary general cash offer for Neptune Orient Lines (NOL), Singapour based container shipping company.